Steps for getting a Motorcycle License. How to get your Motorcycle Permit. Register and Pay for the Basic Rider Course on our web site. Note: If you have at least 1,000 miles of recent riding experience and you have your own motorcycle, you can take the BRC2 / Experienced Rider Course rather than the Basic Rider Course. If you have riding experience, but you do not have a motorcycle, you can use one of our training motorcycles in the BRC – Returning Rider Course. Go to the RMV to take the permit test. You need to get 18 out of 25 multiple-choice questions correct to pass. To study for the permit test, you should read the Motorcycle Operator’s Manual. You do NOT need an appointment. Get there at least 2 hours before closing time. You also need to bring the documents that are required for a “REAL ID” or to prove “Lawful Presence”. After reading that page, you can then click on the “document checklist”. The fee for the motorcycle permit is $30. Tell them that you plan to take a Motorcycle Safety class and pay the motorcycle endorsement fee ($3 per year remaining on your license = $15 for 5 years). By completing the “Lawful Presence” or “REAL ID” process and paying the motorcycle endorsement fee, you will receive your license in the mail rather than needing to physically visit the RMV to get your motorcycle license once you pass the motorcycle course. If you are not able to get a permit before your class, you can still take the Basic or Returning Rider Course. Just bring a photocopy of your driver’s license to class. 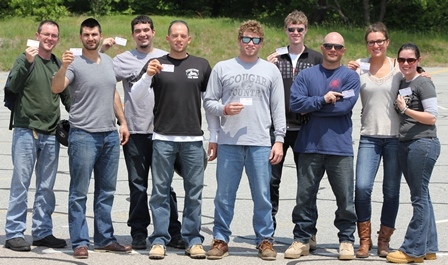 When you pass the class, we will update the RMV licensing database to tell them when you passed the course. Then, soon after the class (within 90 days), go to the RMV to get your permit and complete the “Lawful Presence” or “REAL ID” and payment processes as described above in this “Step 2: Get you Permit” section. Once you pass the permit test, go back to the RMV counter to upgrade your permit to a motorcycle license. Bring a PHOTOCOPY of your motorcycle permit to your Basic, Returning Rider, or BRC2 / Experienced Rider Course. As mentioned above, if you do not have your motorcycle permit, you can still take the Basic or Returning Rider Course. In that case, bring a photocopy of your driver’s license to class. When you pass the course, Streetwise Cycle School will notify the RMV on their licensing web site. If your record on the RMV database is clear (i.e. you hold a valid motorcycle permit, you don’t owe money, and you have completed the “Lawful Presence” or “REAL ID” process), they will mail your new Massachusetts Motorcycle License within 15 business days of passing the course. All unpaid parking violations, Fast Lane violations, outstanding excises taxes, outstanding court warrants, citations or unfulfilled child support obligations must be resolved before an endorsement can be issued. Make sure that the Registry has your proper mailing address. Have a Driver Education Certificate issued by the RMV. Have held your Cass D or M permit for a minimum of 6 months. If there are any issues (i.e. you did not provide a copy of your valid driver’s license or motorcycle permit), you will have 90 days to resolve issues (i.e. get a motorcycle permit, pay outstanding obligations, complete the “Lawful Presence” or “REAL ID” process, pay the motorcycle endorsement fee) and get a copy of your motorcycle permit to us.